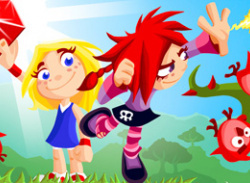 Well the wait has been lengthy, but Giana Sisters DS is finally available to North American gamers. While there was little (actually none whatsoever) fanfare for the release, the game is now available at various Walmart stores. And if you can't find the game locally, NewEgg has it in stock for $19.99, a far cry from the $70+ the European version has fetched in recent years. If..